Born in 1922, Gabriella Crespi studied architecture at the Politecnico of Milan, where his work is influenced by his view of Le Corbusier and Frank Lloyd Wright design experience. Crespi began his career as a designer in the 1950s with its first production of objects, the "Little Moon Collection," sculptures shaped steel moon, in which time stylistic influences converge and transform. In the early 1960s, she established an enthusiastic creative relationship with Dior, particularly in the context of the home and table accessories, and from the 1970s, with furniture. In 1968, the prototype of its first "Plurimo" has been exposed to Dallas a representative of Italian design of the time. In 1970, the daughter Gabriella, Elisabetta, began working in the famous series "Plurimi", whose name is a tribute to Emilio Vedova. These "metamorphic" furniture pieces ("Magic Cube", "2000", "Dama", "Sculpture") are a set of volumes and possible developments of the same form as the change in space, in dialogue perpetual with both the environment and the light. Between 1972 and 1975, she designed the "Quick Change Sofa", the line "Z" ("Z Bar", "Z Office") and the "Rising Sun" bamboo collection, liked the material by Crespi, as she says, "unites strength and flexibility." the famous lamps "Fungo" (1973) are part of this collection. In 1976, the new "Plurimi" ("Ellisse" and "Cubo Tondo"), the collection "Sheherazade" and the "Stone Sculptures" took shape. Between 1978 and 1980 the block library "Standing Stone" (1978), the collection "Yin Yang" (1979), and the two carved tables "Ara" (1979) and "Lunante" (1980) were created. In 1980, Gabriella Crespi designed three new "Plurimi" ("Blow Up", "Eclipse", "Sit & Sip"), and in 1982 she presented "Punto '83," his latest "Plurimo" and unique, to Milan, Museo della Scienza e della Tecnica as part of the exhibition "I Plurimi di Gabriella Crespi" introduced by Vanni Scheiwiller. In 1985, she released the latest interviews about his work as a designer before leaving for a new life entirely devoted to the spiritual quest, it follows a path for it today. In 1987, she traveled to India and met Sri Muniraji, who became his spiritual advisor. Gabriella has lived in India almost continuously for two decades. In 2005, Crespi returned to Italy and began his book "Ricerca di Infinito, Himalaya" which was published in 2007. In 2008, she created for Stella McCartney limited reissue of some of her jewelry collection from 1970. In 2011 Palazzo Reale has spent the vast anthology "sign and the Spirit" Gabriella Crespi. 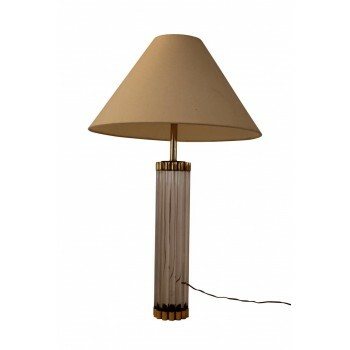 Gabriella Crespi, "Fungo" floor lamp, golden brass and methacrylate, signed on the top of the lampshade, circa 1960, Italy. Measures: Height 184 cm, diameter 70 cm. Gabriella Crespi Puzzle Table, golden brass and glass,made of four elements, original labels,impressed by facsimile signature and "BREV. "Manufactured by Crespi,circa 1973, Italy. Measures: Height 75 cm, length 220 cm, width 120 cm. Gabriella Crespi Puzzle Table, golden brass and glass, composed by four elements, original labels, impressed by facsimile signature and "BREV." Manufactured by Crespi,circa 1973, Italy. Height: 75 cm, length: 220 cm, width: 120 cm.Biography: similar model reproduced in Palazzo Reale Book, Gabriella Crespi, Il Segno e lo spirito, p 77, Electa 2011, Italie. 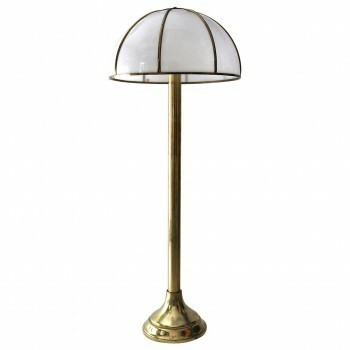 Gabriella Crespi, "Fungo" floor lamp, golden brass and methacrylate, signed on the top of the lampshade, circa 1960, Italy. Dimensions: Height 184cm, diameter 70cm. 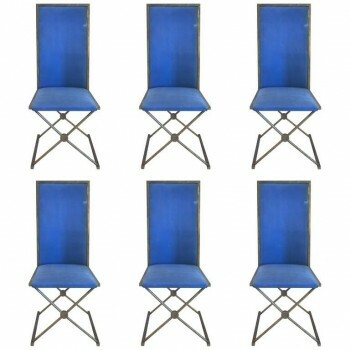 Style Gabriella Crespi, suite of six chairs, Original blue textile and gilded brass, circa 1970, France. Measures: Height 105 cm, seat height 42 cm, Width 43 cm, depth 45 cm. 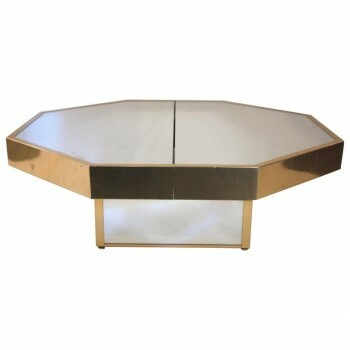 In the Style of Gabriella Crespi, Octagonal Coffee Table , circa 1970, Italy. 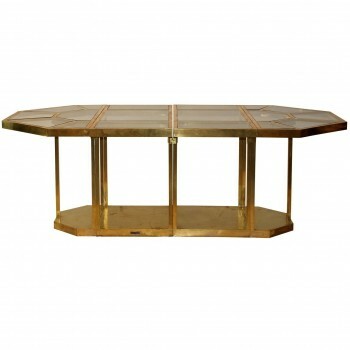 Coffee table octagonal, Gold plated brass and glasses. 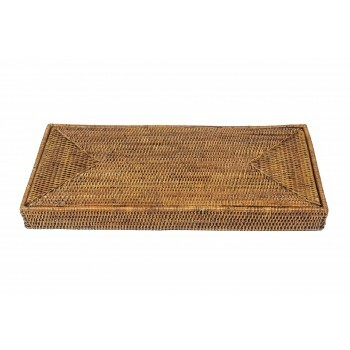 Closed table: Height 34 cm, width 97 cm, dept: 97 cm. Table open: width 1m35. Coffee table by Gabriella Crespi, Model "Sculpture", Wooden structure covered with golden brass, Engraved signature, Circa 1970, Italy. Mechanism metal which toggles the upper part, Measures: Height: 41 cm, Length: 70cm, Depth: 49,5 cm. Gabriella Crespi, Table lamp, Golden brass and plexiglass, Engraved signature, Circa 1970, Italy. Measures: Height: 75 cm, diameter: 45 cm.